American Pharoah Faces Questions After Oaklawn Rebel Stakes Victory: Talented Kentucky Derby candidate American Pharoah kept the momentum going for another week, as he won the G2 Rebel at Oaklawn and took home 50 Derby qualifying points. This means American Pharoah earned a guaranteed spot in the starting gate for the Derby, and barring anything unforeseen in his final prep, will compete at Churchill Downs in May. 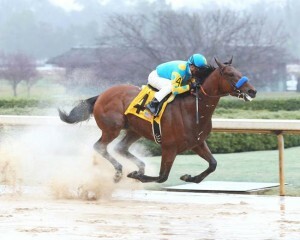 Talented Kentucky Derby candidate American Pharoah kept the momentum going for another week, as he won the G2 Rebel at Oaklawn Park on Saturday, March 14, 2015 and took home 50 Derby qualifying points. But, what did handicappers learn about American Pharoah in his Rebel win? He answered one important question on handling a different surface condition and reaffirmed a running style seen from his previous races. Yet, a couple of mysteries still exist. At least, now handicappers know not to take points off American Pharoah if rain occurs. He won the Rebel on a sloppy, sealed dirt surface. Although Pioneerof the Nile progeny handle mud, American Pharoah’s dam Littleprincessemma competed on a sloppy track once in a two-race career and ran last. 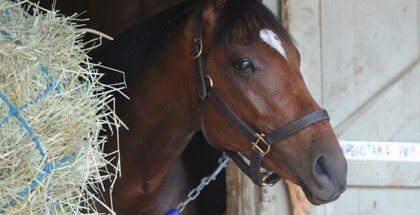 That fact does not matter anymore, since current form trumps pedigree and American Pharoah won a graded stakes on slop. In addition, American Pharoah loved setting the tempo in his other races and showed this habit again in the Rebel. He turned a moderate to slow, uncontested lead into a powerful victory for the third time in a row. The same scenario occurred in the G1 Frontrunner at Santa Anita and G1 Del Mar Futurity before that. In fact, the only race American Pharoah lost came when he needed to duel in his career debut and faded to fifth. This leaves the question on whether American Pharoah only runs well when left alone up front. In the Derby, a faster horse may take the lead early and American Pharoah must show ability to pass at least a couple of horses unless his connections plan for a wire-to-wire strategy. Other questions remain going forward too, especially on the pedigree front. His longer distance potential beyond nine furlongs appears dim on paper, at least on the bottom side. On the top side, he looks okay for distance. Pioneerof The Niles tend to handle route races and boast an average winning distance of 7.4 furlongs according to BRIS. Unfortunately, his dam side consists of sprinters. Littleprincessemma receives a pass for only competing in two lifetime races. Going back two generations though, her dam Exclusive Rosette only won three sprints in a 17 race career. Exclusive Rosette produced 11 different horses, and not one of them won a route race! Of course, asking how many of those horses attempted routes is fair too. Also, can American Pharoah handle a rushed schedule? 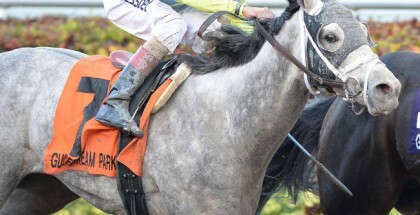 He just came off a six-month layoff to win the Rebel and now must cram in one more prep race. Fatigue could happen two months from now. Even without fatigue, American Pharoah must answer whether two prep races after a three race campaign last year provides enough foundation. Super Saver, Animal Kingdom and I’ll Have Another won the Derby with only two prep races in their three-year-old season. Animal Kingdom started twice in his two-year-old season too. In the last two years, Orb and California Chrome won with three prep races beforehand. 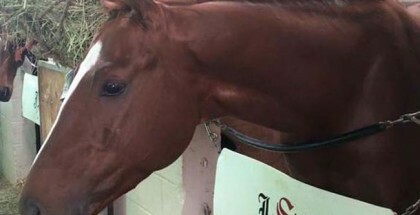 California Chrome raced an astonishing seven times as a two-year-old, while Orb started four times. American Pharoah’s expected five overall races going into the Derby is not the lowest out of this group, nevertheless falls on the low side. American Pharoah gives the impression of an immensely talented horse, with some pedigree and foundation issues. Great racehorses overcome pedigree and handle adversity, and this colt certainly might turn out special. Some handicappers note he sprung a shoe in the Rebel and won easily anyway. Be sure to watch the final prep race next month to see whether American Pharoah faces any new adversity beyond shoe issues. If he out-duels other quality speed or perhaps rates for the first time and wins, then give extra points for his chances on the first Saturday in May.